This is the third of four posts on the parade. 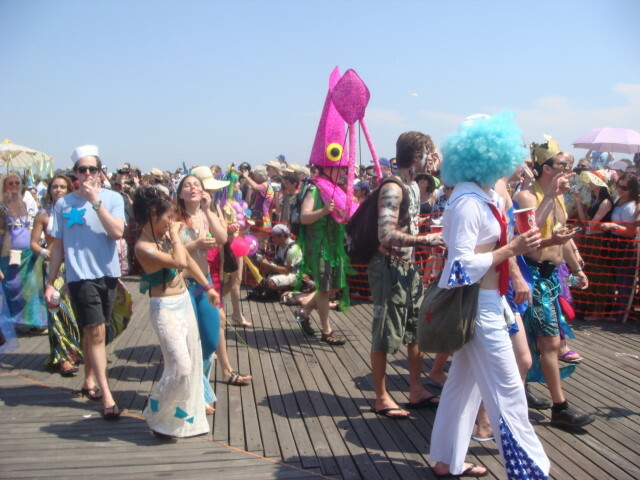 In my earlier post, I mentioned that the West Village Sea Monster Marching Band came on and started playing. 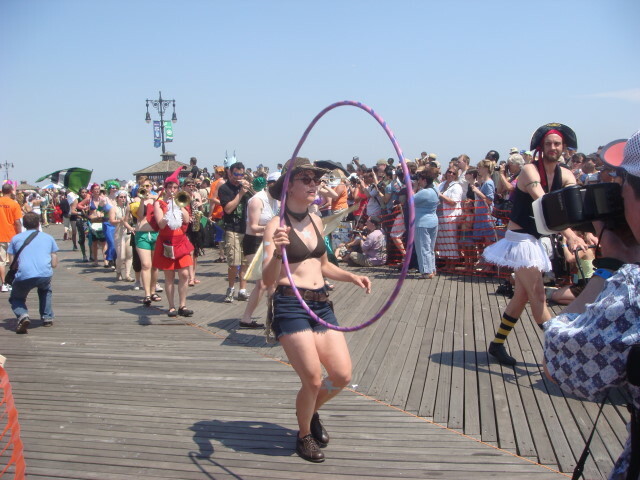 Following them was an old favorite: hula hoopers. I always post pictures on hula hoopers; it’s the law. This was one of the best points in the parade. The music was loud and catchy (I think) and the marchers broke into dance. A very fun few moments. The next picture shows one of my favorite moments. You have to understand that there were a ton of photographers around, and many were inside the Boardwalk fencing (they had press passes of some sort). They kept getting in the way on some pictures. Well, this next young lady had gone past and the music and dancing got a little more frenzied and she put on one heck of a dance sequence (you can see a male marcher looking on in appreciation, too). Toward the end of it, the photographer in front of me apparently noticed my intense picture taking and turned to see her finish her bit. I think he missed taking any photos at all. Ha! But Famous Ankles was well aware. That’s another photog right next to her, but I think he was too close for his camera to capture her. In a couple of my pictures, he’s just staring. This next lady was in a group called the “Pink Lady Salmons”. Thanks for the smile. The second picture in a row of a pretty girl smiling at me. I am so predictable. I confess, I love the next picture. 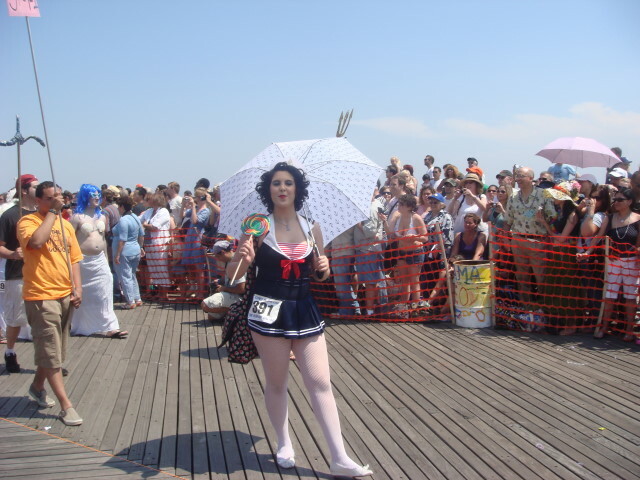 In the first post of the parade, I mentioned how I would have enjoyed a bunch of people in olde-time swimsuits. Well, I guess I got one more here. Sort of. And yes, that’s three pictures in a row like this. Perhaps the biggest non-sequitur in a parade that reveled in meaninglessness: a participant dressed as a mermaid being groped by a gorilla. That’s one woman with a gorilla costume set on her shoulder and legs. On top of that, her (human) hand has a banana and she’s dressed a bit like a Fay Wray mermaid. A “Fay Wray mermaid”? The next picture captures someone I think I’ve seen before. 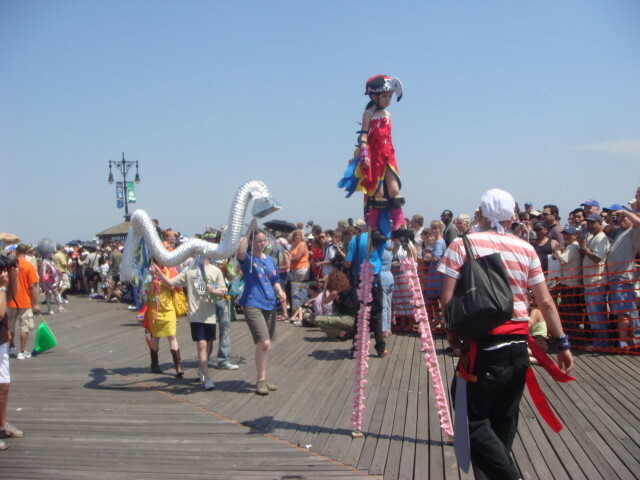 In one of my posts on the 2008 Dance Parade in Manhattan, I saw this little girl (at least I think it’s the same girl) walk a long ways on her stilts. She’s not only talented, but determined. Well done, young lady. Ah yes! Hula Hoops. Lots and lots of them. You’re seeing one of the best parts of the parade. 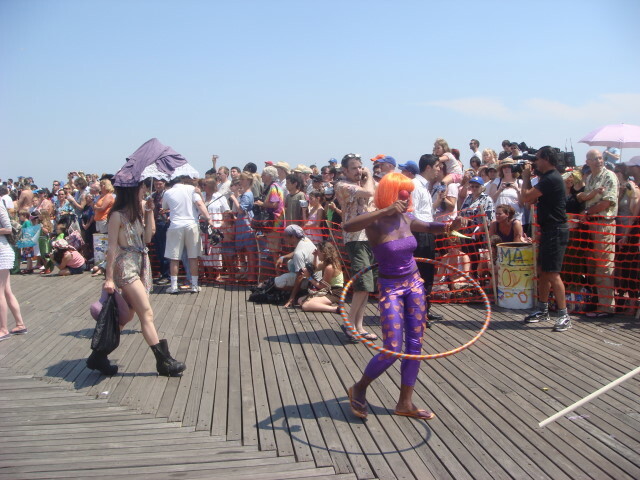 The hula hoopers were in control and it was just fine. More hula hoops! Yes, more. I gotta love it when they do this. It isn’t quite as good as dancing and all, but it works for me. And this lass was really good. One of several King Neptunes in the parade. This guy went to some trouble. Good for him. And the eyeglasses make it even better. The next batch of people were just a gaggle of semi-costumed types. Well, them and a guy as a squid. I approve of the squid-man! As I’ve mentioned, the parade was filled with non-sequiturs. 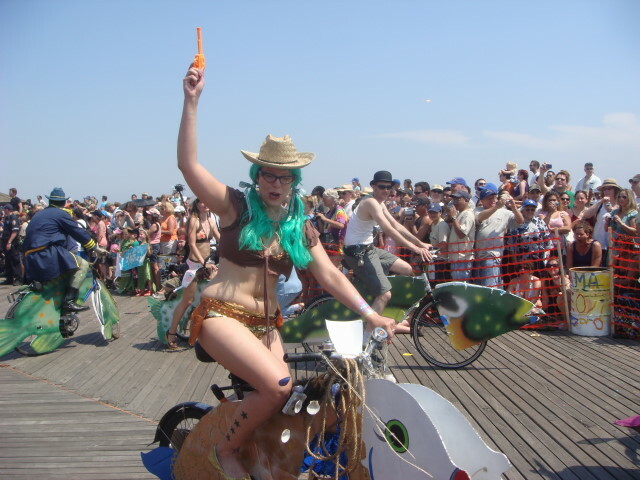 Below is a cowgirl on a bicycle. Well, the bike is supposed to be a fish. So, I guess this is a cowgirl on a fish. With a gun. “Defenders of the Galax-Sea”, indeed. I like this picture, but I also liked the picture I took a moment later (and didn’t put in here) of Wonder Woman. It was a fine Linda Carter immitation. But what does that have to do with mermaids? 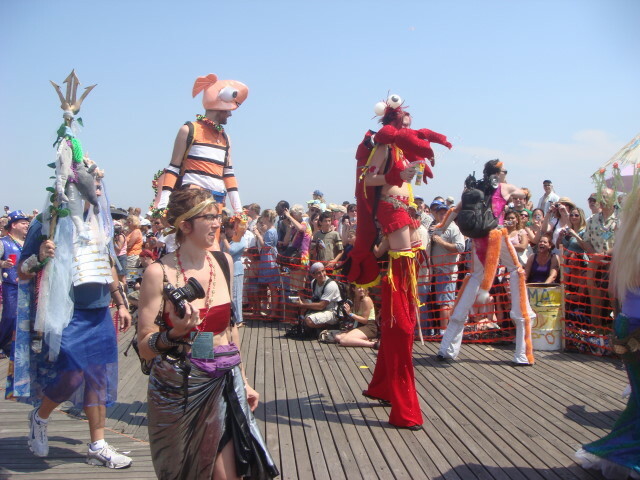 Or Coney Island? 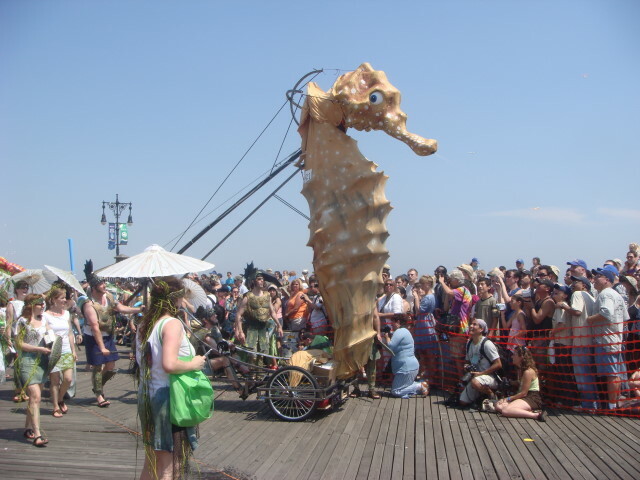 This was the biggest thing that made it to the Boardwalk. The most interesting part: there was water shooting from its mouth. I, and many others, had to protect my camera when it pointed my way. 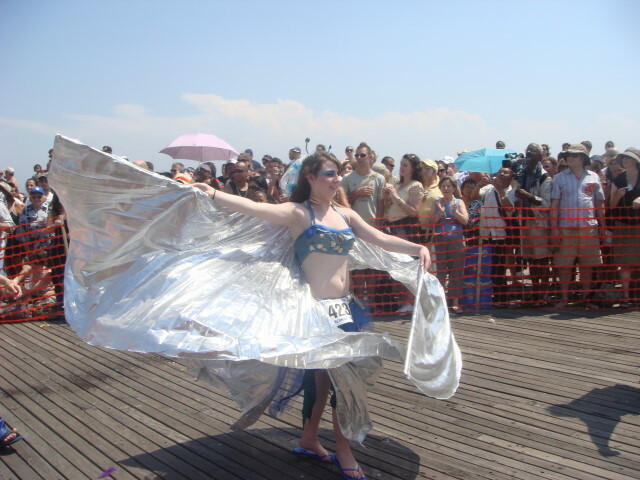 I always love the winged dancers / fan dancers / whatever. I have to post this one just to keep my streak going. When I took the next picture, I knew it would be a good’un. She looked at me preparing to take a picture and threw the confetti right when I clicked. Thank you very much. 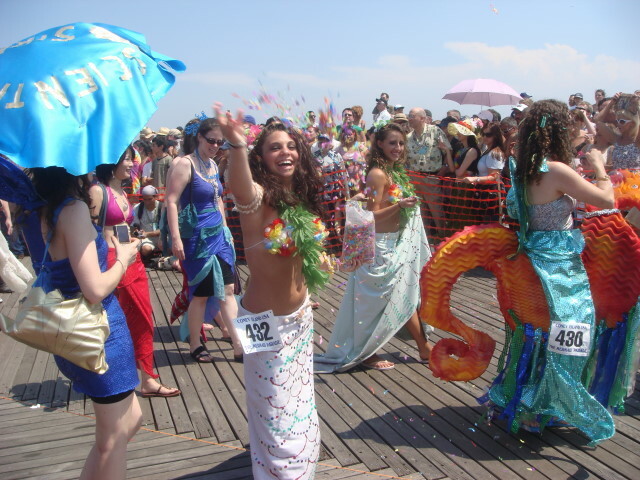 I presume the long dresses are supposed to evoke the mermaid tail. It doesn’t click with me, but maybe I’m not their target audience. 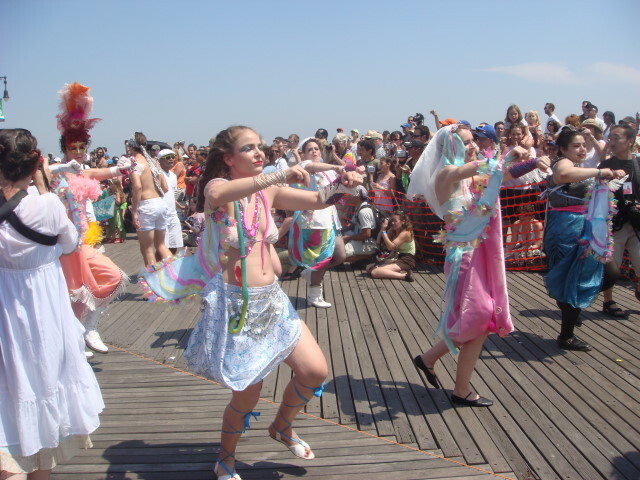 But I still don’t really understand why people come without any real costume and parade. Except for the opportunity to be the center of attention, I guess. 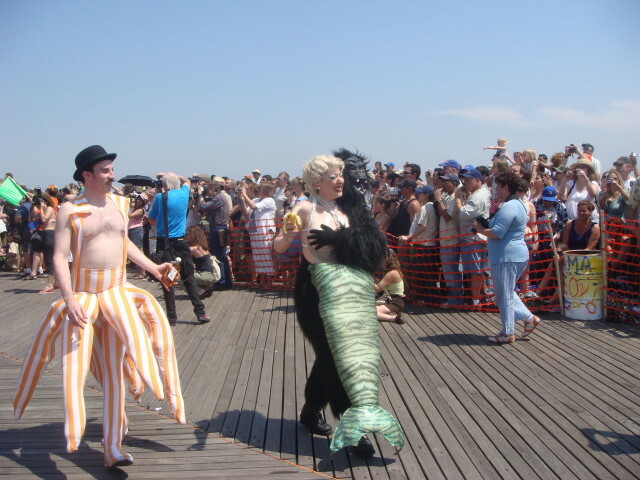 Strictly speaking, this wasn’t a parade about mermaids or summer or Coney Island. 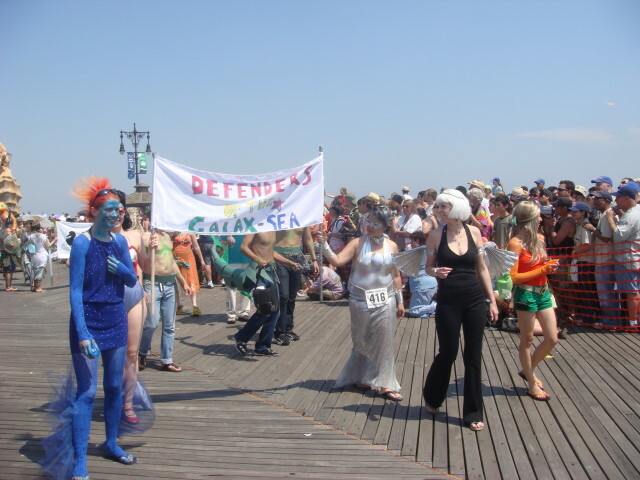 It was an exhibitionists’ parade celebrating their ability to flaunt. I guess. 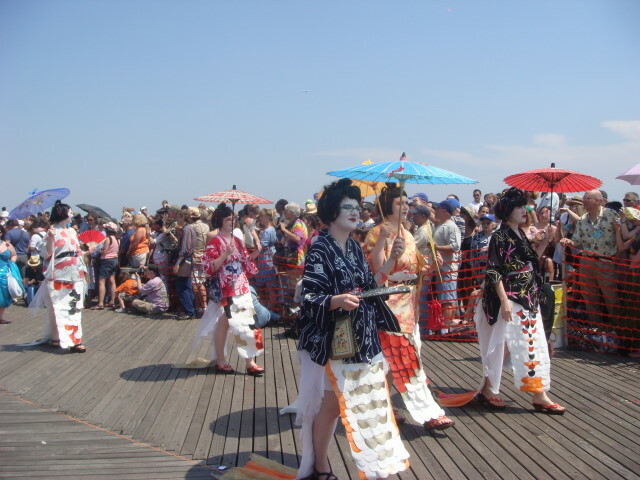 If it’s a Mermaid Parade (or at least named as such), I guess we’re not supposed to expect men in geisha outfits. And I didn’t expect them. I presume it isn’t a subtle jab at the Japanese custom of the very pale makeup being displayed on a day of more-or-less sun worship. Of course, that could have been an interesting study of cultural mores. 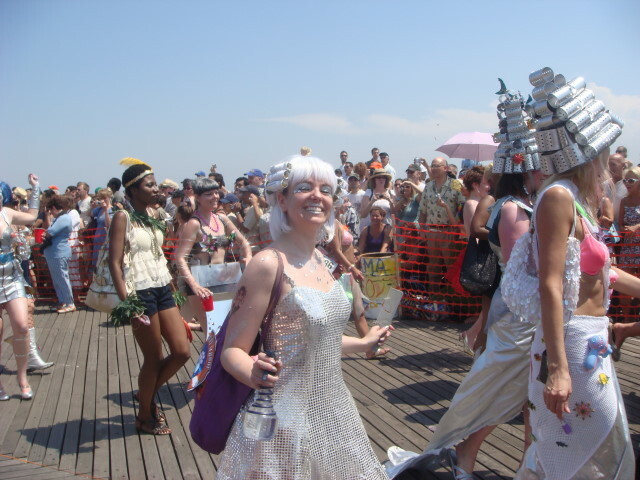 Well, the below picture is a study in the “themelessness” of the parade. Pirate guy all dressed in black. One lady a study in contrast: out for a lot of sun, but carrying a parasol to keep the sun off of her. The other two in costumes… Hey, they ain’t costumes. 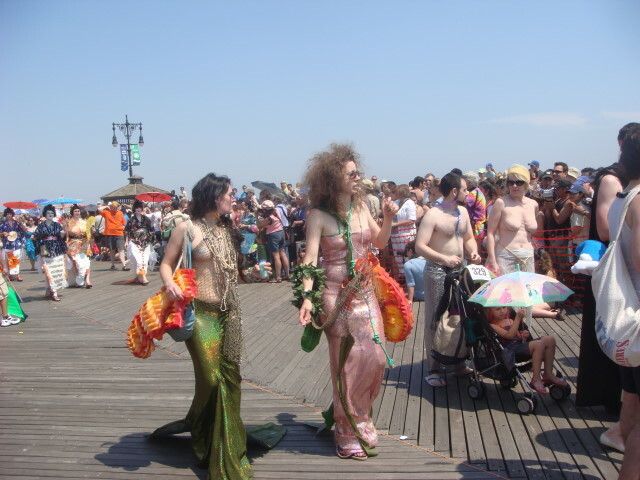 They’re just walking down the Boardwalk. Topical tropical. Women in grass skirts. 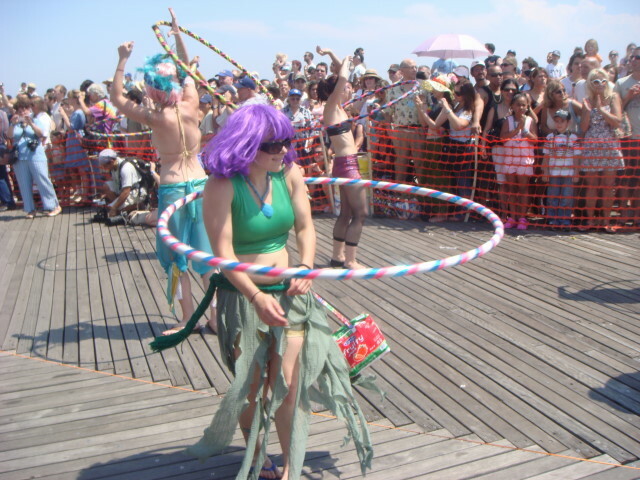 Have I mentioned how much I love hula hoopers in parades? I guess I have. Here’s more. I’m going to end this post with a picture of a purple guy. I think that makes it unique. 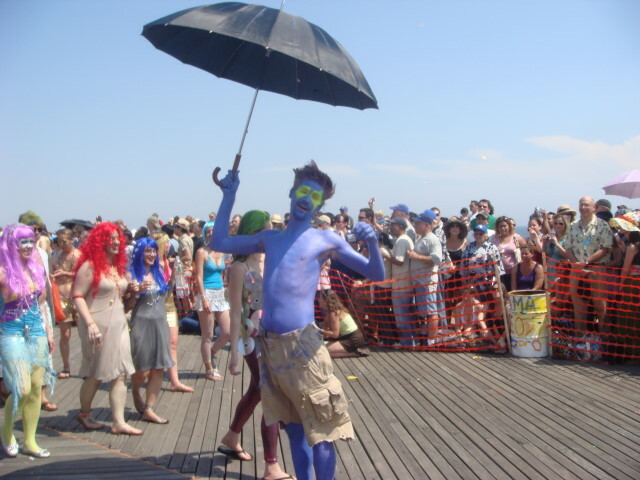 This entry was posted on June 24, 2008 at 5:35 pm and is filed under Events, Parades, Wanderings. You can subscribe via RSS 2.0 feed to this post's comments. You can comment below, or link to this permanent URL from your own site. Thanks for the posting [H]. What a hoot to see what some people would wear in a parade. Hope all goes well with you. Hope you can make it to Tallahassee this year. Well, this is the safe for work version. What some people didn’t wear was a big theme, too. Doing well. I hope to make it in the Fall.